Acid reflux disease--often called gastroesophageal reflux disease, or GERD--is a condition in which stomach acids move in a retrograde direction, rising above the level of the junction of the esophagus and stomach and sometimes into the mouth. Runners who do not otherwise experience reflux often fall victim to its symptoms during their workouts. The chief symptom of GERD is “heartburn,” the painful sensation that arises in the chest when stomach acid comes into contact with the tender lining of the esophagus; others include belching, nausea and bloating. Not everyone who experiences reflux has GERD; those with chronic reflux may experience it in any situation, including lying down to sleep, whereas others require certain triggers. As explained on HealthCentral.com, exercise--and running in particular--can be one of those triggers. Factors that precipitate reflux in active, otherwise asymptomatic people include a high body-mass index (BMI), the most significant risk factor; the type of exercise performed, with running posing a greater likelihood of reflux than either cycling or lifting weights; and the time elapsed between the last meal and the onset of the run, with two or more hours being the recommendation for avoiding reflux problems. In addition, certain sports drinks, unlike water, can trigger a reflux episode. 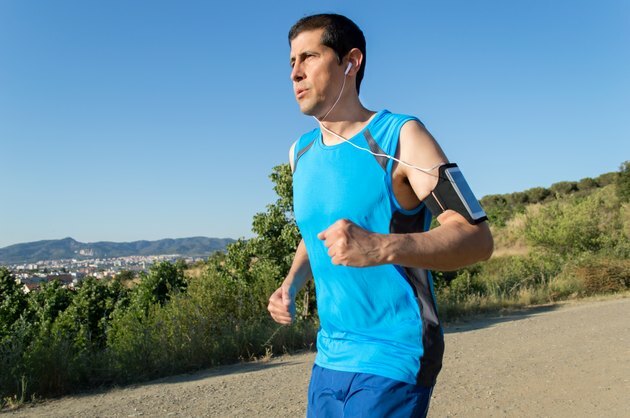 According to the American Medical Athletic Association, the increase in running’s popularity has spelled an increase in reflux-related problems. These include damage to the mucosa, or lining, of the esophagus; chronic cough; laryngitis; damage to the teeth owing to erosion of enamel by stomach acids reaching the mouth; and sinusitis. More acutely, a runner in competition who experiences reflux is clearly not going to be able to perform up to her capabilities. According to Runner’s World, pre-race nervousness alone may predispose people to reflux once the gun goes off. Carbonated beverages, chewing gum, coffee, tea and spicy foods are other common culprits. Less common but still frequently encountered precipitators of reflux and associated problems such as bloating include broccoli, bell peppers, sports drinks and onions. Eating too much, too soon before a workout or race is by far the surest way to trigger a reflux episode, so eating frequent small meals is a better choice than consuming widely spaced feasts. A lot of runners have a serious coffee or caffeine habit; those who experience reflux should be careful to moderate their intake. A variety of common medications can induce reflux as well, so runners taking prescription drugs are advised to consult with their physicians to determine whether a change in their medication regimen may be in order. What Are the Causes of Heartburn While Running? Which Is Better for Runners: Water or Gatorade?